There’s little to recommend a restaurant--any restaurant–on Valentine’s Day. There are exceptions, but often the specials are lackluster, the kitchen is slammed, the servers are exhausted by 7, the other diners are trying to pack a year’s worth of romance into one night (doesn’t work), and the prices are jacked up like the red roses at the florist. Instead, cook at home that night. And, while you’re at it, think about an IOU for the roses when they’re not $75 a dozen. Some quiet unknown evening in April or May, just pop in with them and call that good sense. You may not share my approach to living. I’m most happy and feel terribly rich when there’s a big pot of something luscious bubbling on the stove–especially on a snowy day. Give me a cold day. Any cold day. Let me have time and peace to stir together something that incubates in my oven gently easing its teasing, come-hither aromas throughout the house and drawing near all who enter. Add an entrancing, captivating book waiting for me during that 3-hour parole and I am a happy girl. Ok, include a balanced, but lofty bottle of wine and the deal is sealed. This was taken before the pot went into the oven. More photos later! For Election Day 2016, I’m spending my time making my streamlined Beef Burgundy. It’ll take my mind off what’s going on, keep me from checking my phone or computer too often, and give Dave, the dogs, and me something great to smell. (Below: Right after the Super Bowl. All worn out. Using a large hot skillet to brown and unthaw the roast quickly, you can then add red wine to de-glaze the pan and form the basis of a sauce. After you add the beef, wine, and vegetables to a slow cooker and set it for 4 hours on high, you’ll have dinner right on time. I like to cook my potatoes separately (recipe for mashed cheddar potatoes given at bottom), but if you like them in the slow cooker, add a 3 or 4 you’ve peeled and cut into 2-inch pieces right along with the carrots and onions. Heat a large skillet over medium-high flame with 2 tablespoons canola oil. Add frozen pot roast sprinkled evenly with 1 teaspoon salt and 1/2 teaspoon pepper. Brown well, covered, 10-15 minutes; turn and spread evenly with the horseradish, cooking another 10 minutes. Add wine and cook another 5 minutes uncovered or until the wine has cooked down a bit. Add browned beef and wine, scraping the bits from the bottom of the skillet into the slow cooker. Place the remaining vegetables, and the rest of the thyme and bay leaf on top of the beef. Sprinkle everything with one last good pinch of salt and pepper. Put the lid on top and cook for 4-5 hours or until meat and vegetables are tender. COOK’S NOTE: You can sub 3 good-sized sprigs of rosemary for the thyme and bay. Add one on top of the first (bottom) layer of vegetables and two on top of the meat. Copyright Alyce Morgan, 2015. All rights reserved. 2 tablespoons chopped green onions (just greens is fine, but both the greens and white will work) or chives — See note below if serving meat over potatoes. 1. Place potatoes and 1/2 teaspoon salt with 1/4 teaspoon pepper in a 6-quart pot and cover with water–plus an inch or so. Cover and bring to a boil. Reduce heat and simmer for 20 minutes or until potatoes are just tender. 2. Drain and put potatoes back in the hot pan with the butter and the cheese. Mash well and then stir in about half-cup of the milk. Mash again, adding more milk if needed, until potatoes are moistened and tender. Taste, adjust seasonings, and spoon into a bo wl. Garnish with green onions or chives, if using, and a little of the grated cheddar. **I don’t peel these, but you’re welcome to if you’d like. 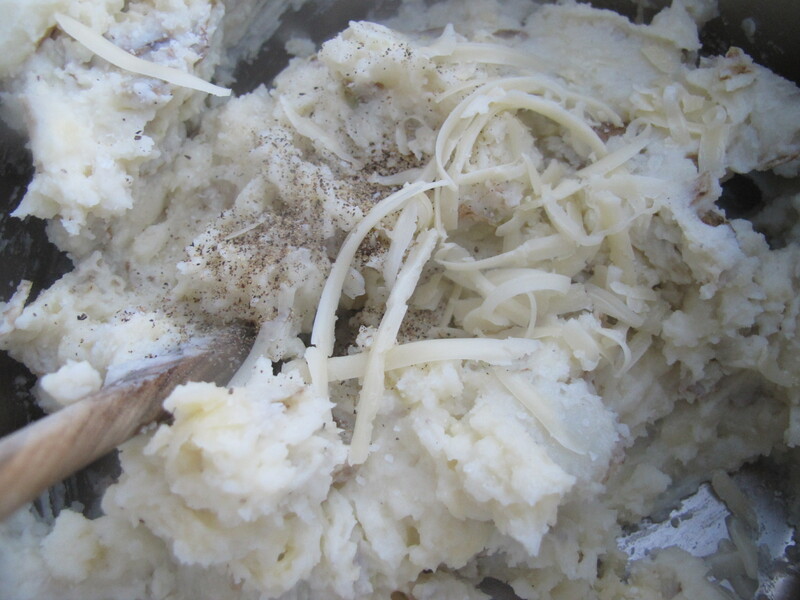 I like the texture of hand-mashed and unpeeled potatoes and am all over that fiber. MEAL OPTIONS: Replace carrots in the slow cooker with butternut or acorn squash pieces. Trade fennel for celery. Skip the wine and use low sodium beef broth. NEED MORE? Green salad and crusty bread with butter are the quintessential accompaniments if you’re really hungry or have more people. You might like my Apple-Cheddar Green Salad with Spicy Honey-Apple Cider Vinaigrette. DESSERT: Maybe none at all…. But if you need something: Apples and cheese if you haven’t made the salad above. If you have, try Pears with Stilton, and Walnuts. Sauté an onion, two chopped carrots, 2 chopped stalks celery, and a minced clove of garlic in a tablespoon of olive oil in a large soup pot over medium flame. Season with 1/2 teaspoon kosher salt, 1/4 teaspoon fresh ground pepper, a pinch of crushed red pepper, a teaspoon of dried thyme, a bay leaf, and 1/2 cup fresh minced parsley. Cook until the vegetables are starting to soften. Stir in 1-2 cups of chopped, well-trimmed leftover pot roast, all of the sauce or gravy, 1 15-ounce can of chopped tomatoes, two quarts of low sodium beef or chicken broth, 2 or more cups of water, and a few drops of hot sauce. Bring to a boil. Add two peeled and chopped potatoes, 1 cup of chopped cabbage, and two cups frozen mixed vegetables or fresh vegetables such as trimmed and chopped green beans, English peas, zucchini, etc. Lower heat to a steady, but gentle boil, cooking until everything is tender. Stir regularly and add any leftover, cooked, and chopped vegetables from the slow cooker for the last 5 or 10 minutes to heat through. Pour in more water or broth if the everything isn’t floating very freely in the liquid. Taste and adjust seasonings as needed, including hot sauce. Serve hot with crusty bread for dunking. Options: You can add a 1/2 cup (or more) of a very small pasta — such as tubetti or elbow macaroni– during the last 15 minutes of cooking or, if you’ve time, 1/2 cup barley, which takes 45 minutes. If you’d like to use spinach, add it during the last five minutes. STORAGE: You can cool, put into containers with tight lids, and store in the refrigerator 2-3 days or in the freezer for 4-6 months. Label and date your soup! It freezes better without potatoes or pasta, if you can manage it. If not, it’ll still be a good dinner you didn’t have to cook that night. I cooked Monday for Inter-Faith Hospitality network (IHN) families; it’s something I’ve done for years at more than one church. It’s a way of living life that makes a lot of sense to me; I like to cook and there are people who need dinner. Here in Colorado Springs at First Congregational Church, we bring already cooked or nearly finished complete meals to a church kitchen where families without physical homes gather, eat dinner with us, and then spend the night. A group of churches and temples work together and the homeless people spend a week at one place and then move to another while awaiting jobs and/or permanent housing. It gives all of the congregations a chance to participate without burdening any one financially or otherwise with the full-time housing of the ever-changing group. Typically, but not always, a dinner coordinator makes contact a couple of months ahead and asks what I’d like to make; for other churches there’s a set menu for each week. The families aren’t the same, so it doesn’t matter if there’s meat loaf on Monday and chicken with rice on Tuesdays, etc. every time. That gives the dinner coordinator a repeating group of tasks that the volunteers become used to. For instance, if I’m a shopping volunteer, I might know that every two months I’ll make a run to Costco for fresh milk, ground beef, chicken pieces, broccoli, spinach, etc. Once a year, I might need to buy paper napkins and cocoa mix. If I’m a cooking volunteer and I’m scheduled for Wednesday, I know I’ll be making baked potatoes with toppings. I find I like both options, though the latter gives me time to spend with other volunteers cooking in the kitchen rather than fixing food on my own at home.